For Craig and Hannah Chaney of McKinney, Kentucky, their son Kase is a miracle. First doctors told Craig and Hannah that they wouldn’t be able to have children. Then, while pregnant, Hannah was struck by a car. Finally Craig and Hannah welcomed their son, Samuel Kase Chaney, ahead of his due date in 2015. But a series of troubling events foreshadowed what would be a harrowing three-year journey for the family. The first occurred when Kase was two weeks old. He became inconsolable and turned blue in the face and white around the mouth. Craig and Hannah rushed him to their local ER where doctors did a lumbar puncture before sending him to UK HealthCare’s Makenna David Pediatric Emergency Center via pediatric transport. All tests came back negative, and Kase was sent home with a diagnosis of a virus and the instructions to perform sternum stimulation should he again become agitated and turn blue. A few weeks later, during a diaper change, Kase turned blue in the face and he stopped breathing. After Hannah gave him mouth-to-mouth, she called Kase’s local primary care provider who couldn’t see him until the evening. Shaken by the incident, the Chaneys rushed Kase back to UK. By the time they arrived, Kase was breathing again as if nothing had happened. Doctors watched Kase and ran tests, but couldn’t find anything wrong. The Chaneys were sent home, but soon after, Kase had another episode, and they rushed him back to UK. And once again, by the time they got there, Kase seemed fine. It wasn’t until a nurse drew some of Kase’s blood for testing that he again turned blue in the face. Kase was experiencing cyanosis, a condition in which the skin turns blue as a result of poor circulation or inadequate oxygenation of the blood. Kase was admitted for eight days for observation and testing, during which a chance encounter set Kase’s treatment into motion. A doctor, looking for another patient’s family, entered Kase’s room by mistake. As he apologized for his error and started leave the room, Hannah asked him a question that made him stop in his tracks. As Hannah explained Kase’s mysterious condition, the doctor smiled, held out his hand, and introduced himself as Dr. Krishna Pancham, a pediatric pulmonologist. “I’ll be your son’s doctor,” he said. Three months later, Kase was diagnosed with laryngotrachobroncheomalacia. His entire airway was collapsible from above his voice box to the bottom branches of his bronchi. Kase’s doctors collaborated with other doctors around the world about his condition and prognosis. There wasn’t a child alive that had Kase’s condition. Kase spent another 98 days at Kentucky Children’s Hospital (KCH). During that time, the Chaneys forged strong relationships with Kase’s care team. The Chaney’s were determined to stay positive and upbeat around Kase. Any serious conversations about his condition were held outside of his room. “While at KCH, we have been blessed with excellent nurses and wonderful doctors, but above all we are very thankful to God each day for life with Kase,” said Hannah. They started the social media hashtags #speaklife #SamuelKase as a way to keep family and close friends informed. This positive outlook influenced every conversation about Kase, even as his oxygen levels dropped daily. Craig and Hannah were active in Kase’s care, from learning to change his tracheal tube to administering and monitoring oxygen. They did everything they could to learn about his condition. “If you’re going to send me home with a medically fragile baby, I want to be able to take care of him,” said Hannah. During his 98-day stay at KCH, Kase suffered from increased CO2 levels, to the point where he was sedated for three days. On the drive back from Cincinnati Children’s Hospital, where Kase was seen about his subglottic stenosis, a condition involving the narrowing of the airways around the vocal cords, Hannah and Craig talked about what could be causing the increased levels of CO2. Falling back on their research, Hannah and Craig speculated as to whether mucus was trapped in Kase’s tracheal tube. Air was getting in, they mused, but not out. 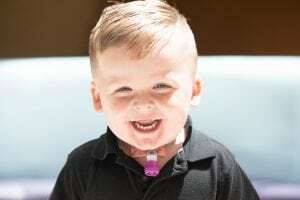 Following Dr. Bernard’s mantra “when in doubt, change it out” ­– meaning the tracheal tube ­– Kase’s CO2 levels fell immediately after a trach change. After being told initially that Kase might not live past six months, he is now a lively, inquisitive three-year-old. He has been in the hospital over 200 days of his life, but he still has plenty of normal childhood experiences, including riding the combine with his dad, riding on parade floats and visiting the pumpkin patch with ventilator in tow. Kase was the youngest child at UK to have his airway reconstructed, going from 18 to 80 percent open. The subglottic stenosis will have to resolve on its own, and he had his tonsils and adenoids removed to prevent sleep apnea. Now Kase is approaching his next milestone – having his tracheal tube removed a full eight years ahead of schedule. But Kase’s unceasing resilience has his parents relishing the moments most people take for granted.